Born and raised in Melbourne, Australia, I wanted to be a palaeontologist from the moment I could pronounce the word. I studied science at Monash University from 2003 to 2006 with the aim of pursuing a career in palaeontology, and in 2011 I completed my Ph.D. on ostracod biostratigraphy and palaeoenvironmental reconstruction. Bachelor of Arts and Bachelor of Science, Monash University, 2003–2006 (Completed). Majors: Geosciences, Geography; Minors: Biology, Indonesian. Honours Degree of Bachelor of Science, Monash University, 2007 (First Class). Project title: Cretaceous microfossil atlas, refined biostratigraphy and palaeoenvironmental interpretations of southern Brazilian offshore basins. Doctor of Philosophy, Monash University, February 2008–May 2011 (Completed). Project title: Early Cretaceous Ostracoda of the Santos Basin, Brazil: biostratigraphic analysis and palaeoenvironmental interpretation of the pre-Salt strata. · Buchan Field Trip, Second-Year Field Geology (ESC 2132; 2008, 2009). October 1, 2011–January 31, 2015. ﻿Sofie Heinsvig: Biomechanical appraisal of the neck in the Pleistocene giant horned turtle Meiolania platyceps (Uppsala University; completed June, 2013; co-supervised with Benjamin Kear). Seela Salakka: The method of tooth replacement of Euhelopus zdanskyi: implications for the evolution of high tooth replacement rates in titanosauriform sauropods (Uppsala University; submitted in June, 2014; co-supervised with Benjamin Kear). Ada Klinkhamer: Limb biomechanics of Australian Cretaceous sauropods (University of New England; March, 2014–present; co-supervised with Stephen Wroe). Monash University Geological Society: 2003–2011. Uppsala Universitet Geologiska Sektionen: 2012–2015. Society of Vertebrate Paleontology: 2012–present. Australian Age of Dinosaurs Museum of Natural History Million Year Member: 2013–present. Flat Rocks, Victoria, Australia (Cretaceous: Dinosaur Dreaming): 2004, 2005, 2006, 2009. Chatham and Pitt Islands, New Zealand (Cretaceous–Paleocene: Monash University): 2008. Shark Bay, Western Australia (Pleistocene–Holocene: Monash University): 2008 (×​2). Cape Otway, Victoria, Australia (Cretaceous: Dinosaur Dreaming): 2008, 2016, 2017. Aracaju, Sergipe, Brazil (Cretaceous: Monash University): 2009. Winton, Queensland, Australia (Cretaceous: Australian Age of Dinosaurs): 2011, 2012, 2013, 2014, 2015, 2016 (x2), 2017 (x2). Richmond, Queensland, Australia (Cretaceous: Kronosaurus Korner): 2012, 2014, 2015. 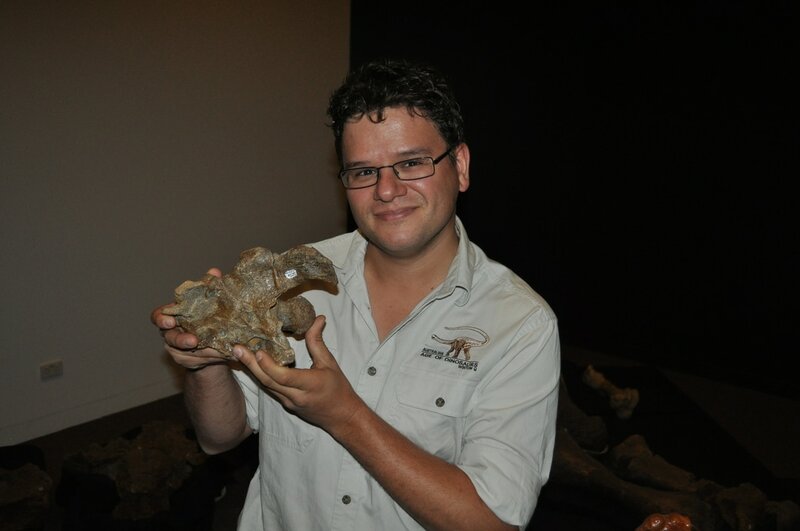 South Walker Creek, Queensland, Australia (Pleistocene: Queensland Museum): 2015, 2016.